So today is Day 1 of my first challenge! 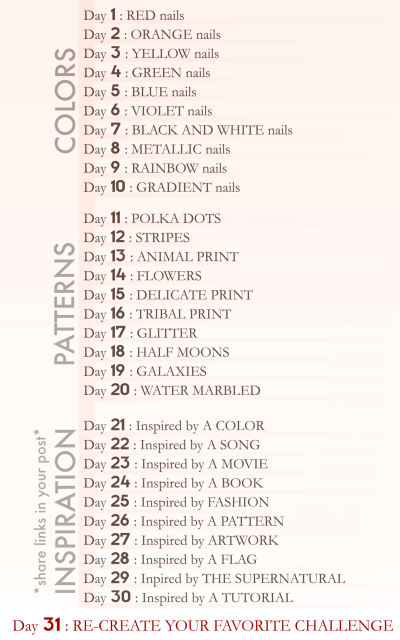 It is a 31 Day challenge hosted by Kimber's Lacquer Korner. Day 1 is Red Nails. Now when I went to do this I realized that I only own 2 red nail polishes. One is Cover Girl Candy Apple, it is a bright red red cream that I bought years ago for a 4th of July mani. The other one is the lovely China Glaze Ruby Pumps. This is really pretty! I love how the red is the same shade, only one is shiny and the other super sparkly...gives a very cool effect! I love these!! Great contrast, great design! Hi Joanna! Just found your blog through one of the challenge links. My gosh, your nail art is spectacular!!! You got a new follower!!! I'm looking forward to seeing what you come up with in this challengE! !